My dinner buddy is a meat lover. Any dish as long as it has meat on it, he'll like it. Though I'm a seafood lover myself, of course I also give in to meat dishes too. 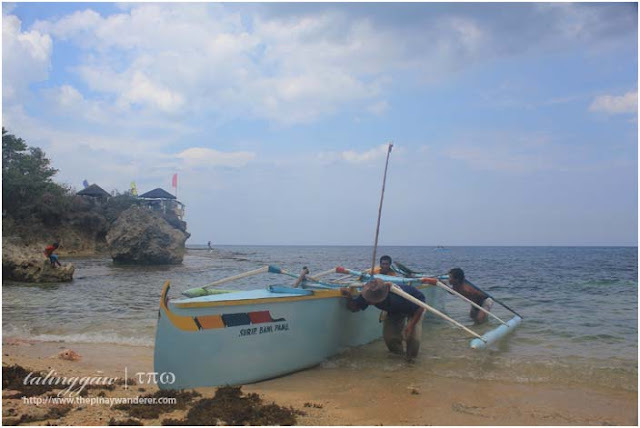 Yesterday, he suggested that we go to Snackaroo, an eatery that specializes on affordable steaks, which he and some of his officemates discovered and frequented for lunch. 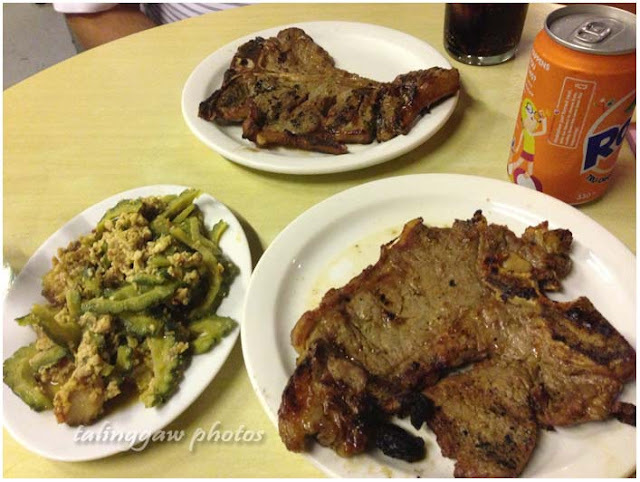 Snackaroo is a usual eatery you'll find in most corners here in the Metro. It's an open-air eatery, very simple with ready-to-serve dishes. But you know what? Snackaroo's front parking is full, most diners here come in on cars. Hmmm, maybe their steak is really a must try. Anyway, since it is steak their specialty, of course we ordered for it. 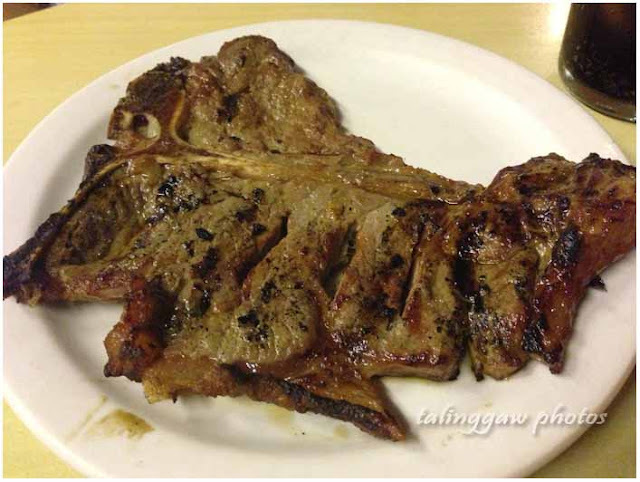 I was supposed to order T-bone steak while my friend a porterhouse. Unfortunately, only the porterhouse is available so we both go for it. I check out the counter for ready-to-serve dishes and found sauteed ampalaya so I also ordered one. My friend loves their papaitan and also got one but it's for take-out, for his mom. After 15 minutes of waiting, our porterhouse steaks arrived. It's ordinary-looking, no sidings nor plating, just plain steak in a plate. It was served with gravy, a sort of gravy you'll find in most fastfood chains. My friend asked for a vinegar and soy sauce and created a dip out of it, with a few drops of chili sauce for an added zing. 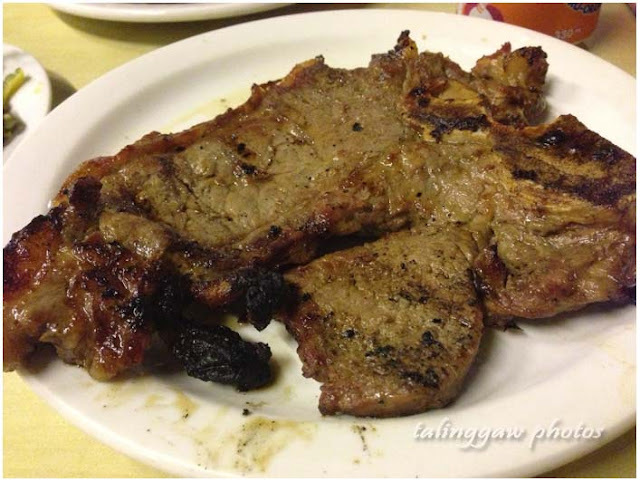 The steak does not come with rice by the way, so you have to order rice separately for PhP15 per cup. So, how was the steak? I would say it's good; the meat is tender and juicy with just enough seasoning. The serving is more than big enough to serve one person. The vinegar-soy sauce-chili dip that my friend created plus the gravy the waiter has served is a perfect dip combination for the steak. And considering the price which is only PhP 140 per order, it's a winner. 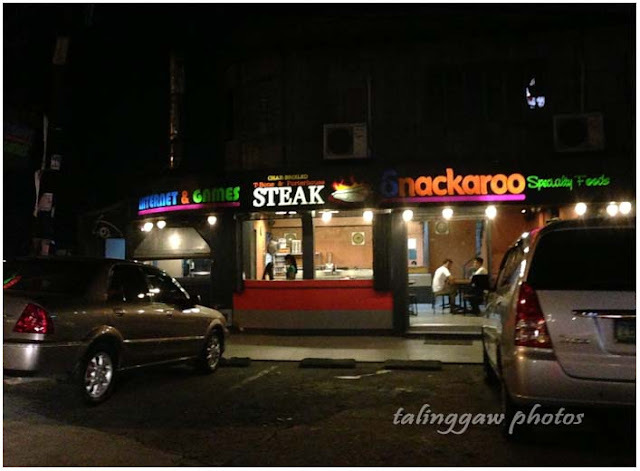 So if you're craving for steaks but would not want to spend much for it, try Snackaroo. It is located in Matalino corner Maginoo Streets in Diliman, Quezon City; at the back of Quezon City Hall, in front of Kenny Rogers/Seattle's Best Coffee. #34 Matalino St. corner Maginoo St.